I could focus on the past, where there have been adventures and loves and moments of “glad grace.” I could spy, scattered among the litter of years left behind, all of my greatest experiences and best impulses. It seems only yesterday…there was nothing under my skin but light. If you cut me I could shine (see poem, below). Or, for a different take on the past, I could remember the first time I gambled, at a casino in Colorado. I played the nickel slots all night, plugging my winnings back in, over and over. The coins turned my fingers gray, then black. When I left hours later, they poured all those shiny silver nickels into a counting machine – and handed back to me the same ten dollar bill I started the evening with. Sometimes my life, on reflection, feels like that night – plugging my nickels in over and over only to end in the same place I started. Breaking even; a lot of change with the only visible difference being the grime left on my fingers. Or I can forget about both sorrow and cynicism, and instead of parsing the past look to the future as if there is much yet to be lived and gained and created; as if my life has been neither gloriously squandered nor tediously labored at with little to show – but instead spent (nickel after nickel) preparing for this day. And the next, if I am lucky. Ah, birthday angst. What are you good for, huh? Perhaps a little perspective? Last night, discussing the annual birthday funk, a friend shared the Billy Collins poem, below. The ten year old narrator in the poem laments the loss of his single-digit years, remembering their magic while recognizing that the sad realities of adult consciousness are upon him. The poem points to both the pathos we feel at the passage of time AND the absurdity of lamenting it at each mile-marker. So, that’s where I’ve landed this morning, smack dab on my double-nickels birthday: with perspective on the past and goals for the future. That feels about right. Here’s to believing that 55 is my lucky year – because that’s how I plan on using my personal power to choose. Lately, I’ve spent an inordinate amount of time writing responses to posts on social media that either anger or disturb me. Sometimes, I carefully craft my response, being careful to choose words that are not intentionally incendiary, removing any accusatory or judgmental language. Other times I allow my fingers to type quickly, spewing forth the outraged reactive language running through my mind. And then I erase them. As I think about the swift passage of time, the ways my days run together and my weeks come to an end before I have time to blink, I realize that this has been stupidly wasteful of my time. Don’t get me wrong: I’m glad I erased these comments before posting them. But if I tried to add up the minutes of precious time I’ve wasted writing/erasing/writing/erasing them…well, let’s just say there are better uses for my time. What often happens when I finally face the inanity of one behavior, is that the absurdity of other things I do becomes impossible to ignore as well. For example, on Saturday I spent the better part of the morning taking an online IQ test, simply because a friend on Facebook had challenged others to do so. After something like seventy-five pattern-recognition questions burned out my retinas, I discovered that I would have to pay $9.95 to get my results. No thanks. Not all of my bad habits are internet related (though most of my time-wasting ones are). If I were to create an exhaustive list it would include things like getting halfway through writing a letter or card, stopping, and never finishing it. Or (God help me!) watching “My Diet is Better Than Yours” instead of turning off the television and picking up a good book. Or staring at the still unpacked boxes in my apartment, thinking about where I will put the stuff they contain…when I actually get around to it. Everyone has bad habits and self-indulgent time-wasters, I know. I am too old and, hopefully, too wise to strive for perfection in my own habits. On the other hand, experience has shown me that I can spend a lot of time spinning my wheels through inattention – that weeks and months and years of a life can disappear with little to show in terms of actually living in them. There’s the poem about how a man dreamed he was walking with God and saw his life as a set of footprints on a sandy beach. Often, there were two sets of footprints in the sand, but at the times in his life that were hardest, there appeared to be only one set. 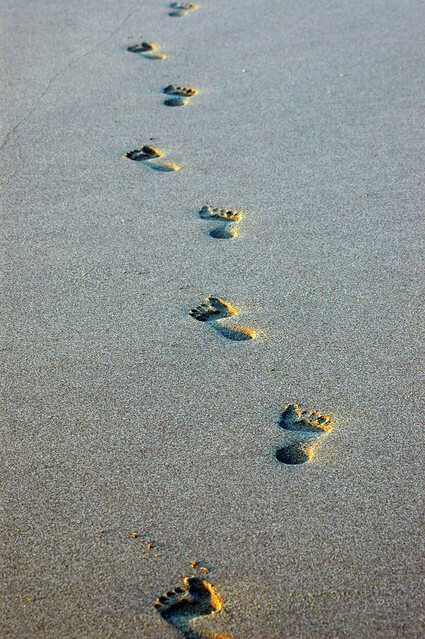 When he asks the Lord about this, suggesting that he had been abandoned in those times, he is told, “Those were the times I carried you.” My dreaming mind changed this story into a walk down the beach where, looking back, there were no footprints. Not because I was abandoned by God, but because I was abandoning my own life. Stupid-easy. Each daily action needs to be stupid-easy, as in, so easy for me that I would feel absolutely ridiculous not doing it. Essentially, take a desired action and breaking it down to the no-possible-resistance level. Focus on action, not the outcome. I focus on celebrating the successful completion of each daily task, not the outcome that it created. Some days, the outcome is great — other days, it’s crap. That’s why I’m focusing on the habit itself, so that I don’t get discouraged. If I complete it, I am #winning. Establish early success. The two points above contribute to early success – establishing a habit of succeeding immediately. Quickly creating a successful chain of daily actions from the very start. Habit: Daily, brief reflection before bed. I’ll let you know how it’s going. If this “stupid easy” habit gets established, I’ll add another. The idea is that positive daily habits, as they are established, crowd out the just plain stupid ones – the time-wasters and energy-suckers. I don’t know many things for sure, but I do know that life is too short not to inhabit each and every day. If I dream again that my life is a walk along a sandy beach, I want to look back at where I’ve been and see at least one set of deeply etched footprints. Note: Will you join me (and Mr. Anthony Ongaro!) in trying your own highly beneficial daily activity(ies)? If so, I invite you to share in the comments! One evening last week, I got dressed up (well, if fleece leggings under a long skirt passes for dressed up) and made my way to Minneapolis’ Orpheum Theater to see the musical, “Pippin!” I was very excited to go to my first big theater event in the Twin Cities – and there was the added element of adventure since I was attending alone (though I planned to say hello to my favorite usher, who was working that night). I had longed to see this show for several reasons. First, since high school, I have loved the show’s most well-known song, “Corner of the Sky”. Second, I saw a piece on CBS Sunday Morning about the preparations and practice the touring cast (the very cast I was about to see) had made to be ready for this physically demanding revival, re-imagined as a circus-themed production complete with acrobatics and high-flying aerials. Third, I knew nothing about the actual story, so the show would be almost entirely new to me. I found my aisle seat, toward the back of the main floor. I was thrilled, as a vertically challenged viewer, to discover that no one was seated in front of me. In fact, mine was the only occupied seat in my entire row and the row in front of me. The house lights went down and the stage lights up, and I was in my own little envelope of space with the show. In Act 1, Scene 4, Pippin visits his grandmother, Berthe (played in the show I saw by the amazing, Tony-award-winning Priscilla Lopez). Berthe’s show-stopping number, “No Time At All”, was a song I knew but didn’t realize was from Pippin. The 66-year-old Berthe/Lopez not only looks incredible when she strips down to a trapeze-artists’ costume, she manages to fly through the air AND SING, appearing completely at home in the aerial number. “No Time At All” becomes an audience sing-along, and while I thoroughly enjoyed belting out the choruses, by the last one, I found myself overcome by emotion. Now, days after my Pippin! experience, I find myself still singing that chorus – and ready to share why it choked me up. One reason was the sheer admiration I felt for Priscilla Lopez. What an inspiration that was – I hope in my mid-60s to be ready, willing and able to engage so audaciously with the challenges life offers me. But there was also a more spiritual component to what I felt. Throughout my life, there have been moments when, in the midst of a special experience, I have felt myself step out of the stream of time. When this happens, my “normal” self remains as is, doing whatever it is doing. In this case, I remained in my seat thoroughly enjoying the performance. But my consciousness somehow steps outside my experience, and is able to look upon it (and myself) with some separation. Briefly, at Pippin, I stood outside the moment, and saw myself shining with enjoyment, radiating life and energy. The worries and cares of the day had dissipated, I was no longer concerned about the financial splurge required to purchase my ticket; no longer worried that I had forgotten where in the unfamiliar ramp my car was parked; no longer awkward about indulging in this experience solo. Looking at myself, I saw beauty. I knew that this is how we are meant to live: without unreasoning fear, without concern for conforming to expectations, but with energy and joy for this moment we have been given. The gift of this present. As we grow older, our sense of time changes. It rushes past us, faster each year. Sometimes I am stunned that another week, month or even year is already gone. This feeling of time rushing past creates anxiety, bordering often on fear. Though people talk about young adults being in too much of a hurry, of their need to slow down and let their lives unfold, I am finding that this is much harder to do at 53 than it was at 23 or 33. Back then, I thought I knew there was time for everything. Now, I am very aware as each day passes that it was another grain of sand in a rapidly diminishing hour-glass. I can’t count the grains that are left and I have no way to accrue more than are already there. This makes it very difficult to allow my life to unfold. To have patience. And so the anxiety creeps in, ratchets up as I worry that I’m not moving fast enough in my life. The gift I received during that musical number was awareness that this is a false sensation. It is always time to be living, always time to make the most of this world we’re given. Spring will turn to fall, it is inevitable. No point in getting all angst-y about it. No point in regretting the past or looking with fear toward the future. I am not in control of it. All I can do is choose how I interact with the gift of the present as it unfolds. I can be in it, living it, or I can waste it with fear, worry, anxiety. We are often advised in life to “pick our battles”. What I’m seeing with new eyes this week, thanks to Pippin!, is that my battle isn’t with Time. 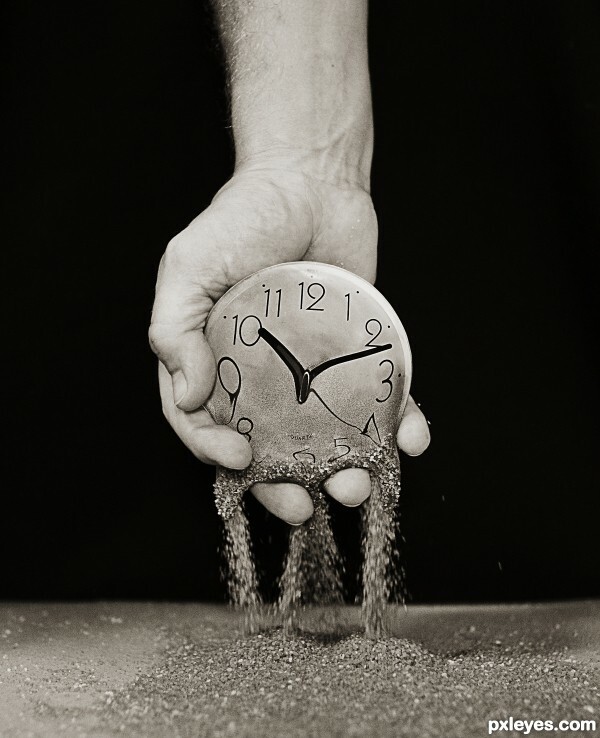 Time is unchanging – time is as and what it is. My battle is with false perceptions of time, which lead to fear and anxiety. And that is a battle I know I can win with faith in God, trust in myself, and attention to this gift of the present. A few years ago, I made some changes in my life that led to the feeling of having awakened from a dream. Those “lost years” were truly gone, having been spent in a haze and rush of doing without any real sense of purpose. When I woke up, I felt that same sense of urgency as Kathe – this life is too precious and too short to waste any more of it sleepwalking. Since then, I’ve made a pretty good effort at living mindfully, at consciously choosing. I’ve actively said “Yes” or “No” based on a picture of my life being about more than getting through it. This winter has been a difficult one for many; the weather extremes have made it so. I am far from alone in feeling that meeting the daily challenges presented have required a much larger portion of my energy than usual – a few minutes on Facebook convinces me of that. And it isn’t that I stopped making choices or living as consciously as possible. It’s that it has became harder to maintain a center or core of certainty. Harder to maintain a vision of where I hope to go, how I hope to impact this world. Some days, I feel like I’m on the right track, I’m acting in ways that are moving me forward. Other days, I simply feel lost. On Tuesday, like much of the midwest, Minneapolis experienced a truly beautiful, warm day. I decided to head outside, and walked several miles through the downtown, over to the North Loop. Along the way, I reveled in the sunshine, stopping to take photos and observe the city and its people. I stopped at a little shop I know of that carries awesome postcards. I went to a combo bike/coffee shop I’d heard of but never frequented. I stopped for a few groceries at Whole Foods market. Then I began the trek home. I was standing on the sidewalk (about two feet back from the curb), waiting for the crossing light, when a woman came up beside me. She said, “Here in Minneapolis we don’t know what’s coming, but we try to make the best of it, right? My only hope these days is in God.” I nodded and smiled, having nothing to add. Then she said, “This light is really long, think I’ll go the other way. Good luck,” and she walked off. Not 15 seconds later, a bus cut the corner too close to the curb and splashed through a pond of melted snow and slush, completely drenching me from head to toe, like in the movies. I freely admit that the incident was funny. I wish it had been seen by someone I know so we could laugh together about it. Or, better yet, captured on video so I could share it with you. Once I got over the initial sputtering indignity of it, I resumed my walk home. However, my mood was completely changed. Instead of the carefree, “in the moment” feeling of my meandering walk downtown, the way home became contemplative. First, I wondered about the woman who spoke to me. Was there a special message intended for me in her comment about not knowing the future, but trying to make the best of things? 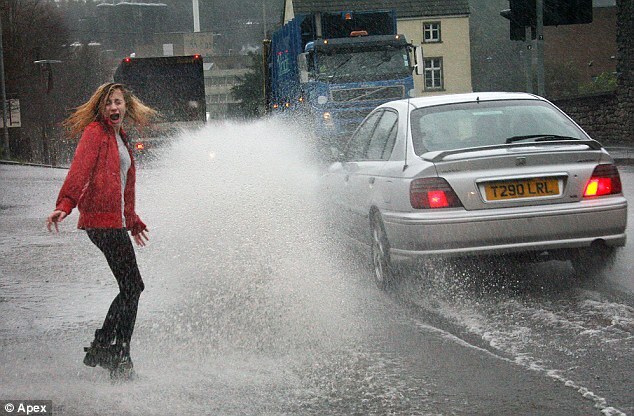 Was the drenching intended to wake me up? Have I been living too much in the moment, and not enough in the world of making the future happen? Have I spent the winter sleepwalking after all? I didn’t come up with any answers on the long, wet walk home. And as I’ve wrestled with the idea of whether I’ve been “sleepwalking” through life too much this winter, I did an internet search and came across a site that said, “The nature of things is that sleeping implies waking: anything that sleeps wakes up.” I found that thought to be a comforting one. Like so much in life, perhaps there is a cyclical nature to sleeping/waking in terms of conscious living. So, for now, I’ve decided to be as awake as I know how to be. Some days that will be easier than others. Some days, I will just enjoy “being” in the bright sunshine of the moment, others I will experience the cold drenching of a wake-up call. Mary Oliver writes “As for life,I’m humbled, I’m without words sufficient to say how it has been hard as flint, and soft as a spring pond, both of these, and over and over…” Isn’t that the truth?